All though we've come to the end of the road... Am I not the only one who had this song in their head when they wrote today's post. And true to my form today's post would be up later than my normal ones. So story time shall we? If you didn't know then you know now that I'm a huge fan of soap operas. General Hospital is one of my favorite shows. I remember visiting my Mom Tea in Louisiana (dad's momma) and she would watch her soap operas. She would bribe us with ice cream if we took naps during soap opera time so she could watch her stories in peace. Of course we obliged. Southern Louisiana is blazin' hot in the summer and we lived for that ice cream everyday at 2pm. I watched soap operas some in middle but only here and there when I was home from school and nothing else was on tv. I was a huge fan of Kirsten Storms (The girl from Zenon) and she joined the cast of days of our lives. Sophomore year of H.S. after I had my back surgery I missed school for a couple of months. My grandma (Momma's Momma) came to stay with me in the day while my parets were at work. Y'all know she watched her soap operas every day. That is when I seriously became a fan of soap operas. Freshman year of college someone told me that Brad Maul retired from acting. ( He was on General Hospital for over 20 years. Y'all I cried when he died) He decided to move back to East Texas and teach at his Alama Matter... SFA! He wasn't on campus a whole lot so it was rare if you saw him. Sometimes I would drag friends to the Theatre building to help me stalk and see if he was there. Obviously we had no such luck or their wouldn't be a need for this post. I emalied the two professors non stop becaue I knew I would be startin the class a week late and wanted to make sure I didn't miss anything imporntant. Y'all I didn't even pay attention to the names of the joint professors who taught the class. So I walk into class all excited and ready to, "do that thang!" Boy was I in for a shock. Over walks Brad Maul. He shakes my hand and goes, Hey Ms.________ so glad to finally meet you. Y'all I about lost my sweet tea I was fangirling so hard. The other 9 students in the class are lookin' at me like I'm crazy. I was like do y'all know who he is. I cried when they killed him off the show. Needless to say the other kids had no idea who he was or why I was so freakin' excited. And that's how I became friends with a celebrity. Y'all were legit friends. We have FB convos on the reg. He was even nice enough to act in my groups final project. And when I decided to drop everything and go to the Spice Girl Concert he just told me to have fun and not worry about school. BAHAHA SUCH AN AWESOME STORY! 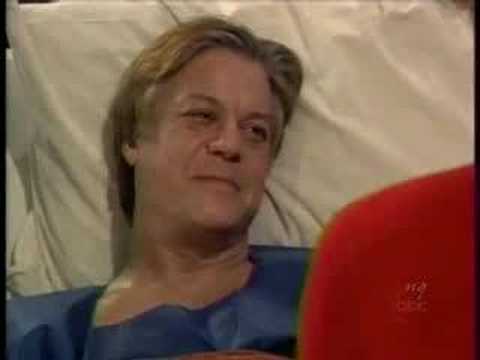 I loved general hospital my senior year of college. Rushed home from class to watch with my roomies! hahaha I love that! I also love that you dropped everything and went to the Spice Girls concert! I have watched General Hospital for a few years now. He must have died off before I started watching. Love the story! I have NEVER been able to get into soap operas, mainly because I want to watch them from the beginning to understand everything. But how do you start from the beginning when that was decades ago?! LOL!! I nominated you for a Liebster, thanks for being such a great blog to read! Hello There, my name is Ashley and I am stopping by to say hello. I am loving your blog and the great posts you are putting out there. We have an awesome giveaway running right now and a winner will be chosen at random on June 15. Why not come join the party! How awesome!!!!!! :)) My mother in law would be jealous!